Europe with its ancient cities with amazing architecture is beautiful in the Winter, plus Austria is full of amazing small towns. So book this freshly discovered Chicago to Vienna flight for $581 r/t including taxes and visit this beautiful country in January. Fly with Air Berlin and get your ticket cheaper than with any other airline. Faredepot provided this deal that we have found on Tarvelgrove. But you should also check some other providers for Chicago to Vienna flights by comparing their prices and see who has the best deal for this route. 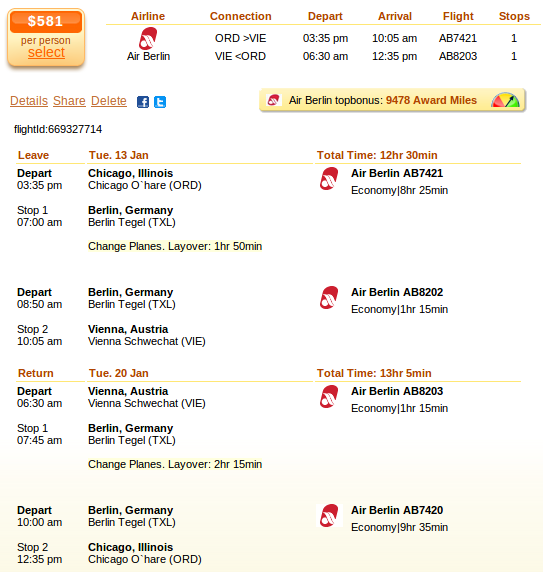 The screenshot shows that your Austria flight departs on January 13 from O’Hare International Airport (ORD) and returns from Vienna International Airport (VIE) on January 20. The flight to Europe has a 1 hour 50 minutes stop in Berlin, while the flight back to the US a 2 hours 15 minute one at the same place. Air Berlin topbonus, the airline’s frequent flyer program, will give you 9,478 award miles for booking this, which is nearly 20% of a free Europe to US airfare. The Air Berlin fare that we have found for $581 is exactly $74 cheaper than the next cheapest flight, a United Airlines fare for $655 r/t. This entry was posted on Tuesday, November 25th, 2014 at 2:17 am and is filed under Airfare Deals. You can follow any responses to this entry through the RSS 2.0 feed. You can leave a response, or trackback from your own site.